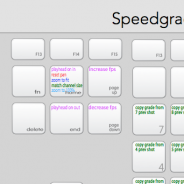 I’m starting to get serious on Adobe Speedgrade CC and I found that the Help file and shortcut reference were a bit lacking so I took on me to edit this keyboard shortcut cheat sheet. In this version you’ll find all the shortcuts I could find on the Adobe website. I mapped them on a MAC and a PC keyboard. Feel free to download, print and share this. It also make a great desktop wallpaper. And please tell me of you find any errors.